The Aquasure Prozone Ozone Unit will help give good water clarity and take the colorants out of your pond by helping remove proteins from the water which leave a yellowy/brown tinge. The The Aquasure Prozone Ozone unit consists of both a protein extractor (foam fractioner) and ozone unit all in one. The Aquasure Prozone Ozone Unit works by using your pond water which is pumped through the ozone unit then through the protein extractor and returned to the pond. This is the easiest and most effective protein extractor we have worked with due to this unit having 2 control valves instead of the conventional 1 control valve. One is used for the adjustment of air flow to the venturi and the other for the adjustment of the air vacuum. You also have the added benefit of this being combined with the ozone unit as an all in one component. Setting up requires you to connect your water pump (5000ltr recommended) to the inlet of the prozone unit. The outlet simply returns to the pond. Plug the Aquasure Prozone Unit in and it will produce 0.042mg of ozone per minute giving you 2.52mg of ozone per hour. This ozone unit is also extremely cost effective using only 25 watts of power! The only maintenance required is a six monthly bulb replacement. What is a protein skimmer ? A protein skimmer is a device that concentrates and removes dissolved material from water by floating it to the surface via an accumulation of air bubbles. It basically consists of a tube (the contact column) for concentration of bubbles, an aeration device (e.g. air stone, venturi) a water inlet and outlet and a removable collection bowl. Some units may add additional features, but the basic design is the same. The name "protein skimmer" is misleading. A more appropriate name is "Foam Fractioner," due to the fact that the bubbles concentrations (foam) serve to separate dissolved material from the water. Most of the material, teamed DOC (dissolved organic carbon) by scientists is produced by the biodegrading activity of certain bacteria, but some is released by algae and other organisms as part of their normal body function. Because the DOC is dissolved in the water they cannot be removed by traditional mechanical filtration methods. Why use a protein extractor ? 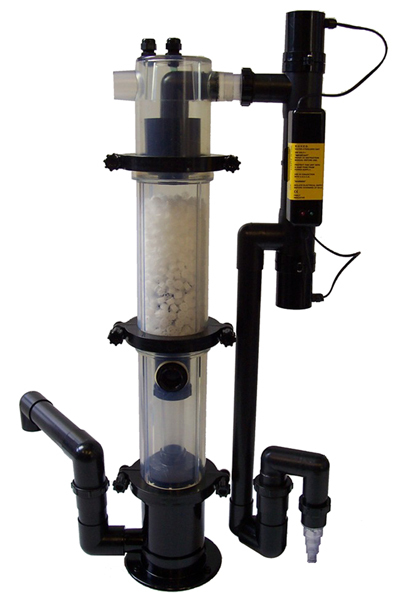 A foam fractionator removes the DOC that a traditional mechanical filter does not. The accumulation of DOC in water, among other things inhibit the nitrifying bacteria and increase the biological oxygen demand (BOD a way of measuring water pollution), thus lowering water quality. Water becomes discoloured and smells foul. Furthermore, some types of DOC can be degraded by bacteria in the water, via a process called Mineralization. Heterotrophic bacteria convert DOC into toxic substances such as ammonia and carbon dioxide, while consuming vital oxygen in the process. How does a protein extractor work ? The two keys to effective protein extraction (or foam fractionating) are air bubbles and surfactants. DOCS are surfactants-compounds whose surface is defined as "active". This means that when a surfactant compound is in water, its non-polar end, labelled hydrophobic or "water hating" seeks the surface in the air. Normally, the only "air surface" in a pond is the surface of the water. However if bubbles are added to the water more air surface is created. More air surface means more surfactants (DOC) are attracted and removed. Smaller bubbles have more surface area than larger ones. Also the longer the bubbles stay in the water the longer its contact time with the surfactant. Bubble size and contact time determine how effective and how fast a extractor will work. Protein extractors take advantage of these physical properties by producing a large amount of bubbles in a controlled space (the contact column). This serves to concentrate the bubbles and the DOC. As the bubbles in the air column rise, the surfactants (DOC) attach to the surface of the bubbles so that its hydrophobic end is "inside" and in contact with the air. The bubbles carry the DOC to the water surface, where it forms foam. The air-preferring DOC stays at the surface rather than re-dissolve into the pond water. This process is repeated thousands of times a minute and a large amount of foam can be generated. The foam grows over time, is collected in a bowl or other vessel, and is to be removed at regular intervals. While there is considerably more physics involved in trying to produce the right bubble size and in the determination of other factors as well, this is a basic operative mechanical involved in protein extracting. The goal of any good extracting is to produce a great number of small bubbles in the contact column. With improved technology of this protein extractor it is possible to remove harmful protein compounds from freshwater by producing micro bubbles from the outset, so it produces foam when other protein skimmers can’t. How long should I run the Aquasure Prozone Ozone Unit ? Twenty-four hours a day. There will be some periods of the day when the extractor will produce more foam than others, but that is natural. Is ozone required with my extractor? It is not necessary to use ozone with a protein extractor. Although, ozone can encourage additional oxidation and breakdown of large molecules, making them more susceptible to removal by extraction and give water more clarity.